MSI P67A-GD65 is the highest-end model in the series, but it's not an 'extreme' solution — those are separated into a different lineup. 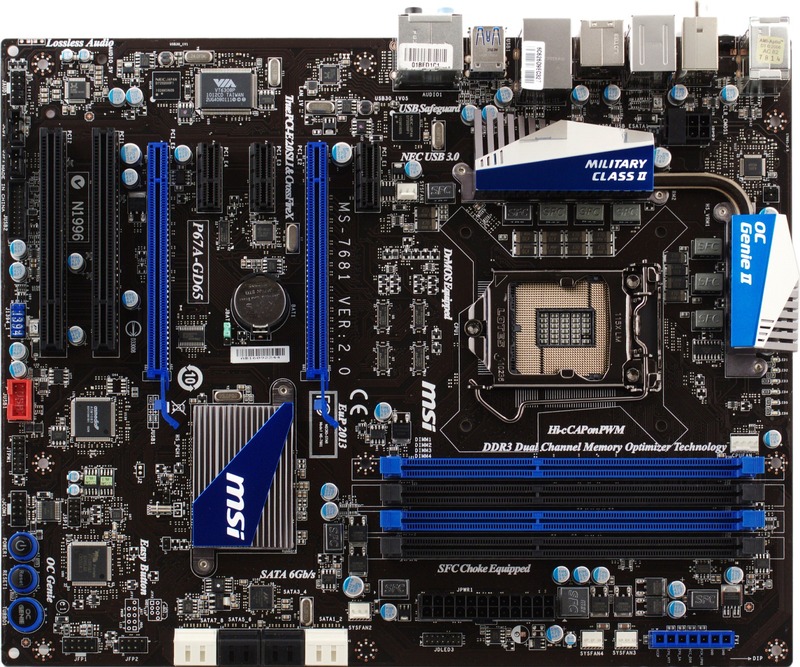 This is a mid-end motherboard that offers advanced functionality and a number of MSI's proprietary technologies. Board's appearance and layout are quite nice. 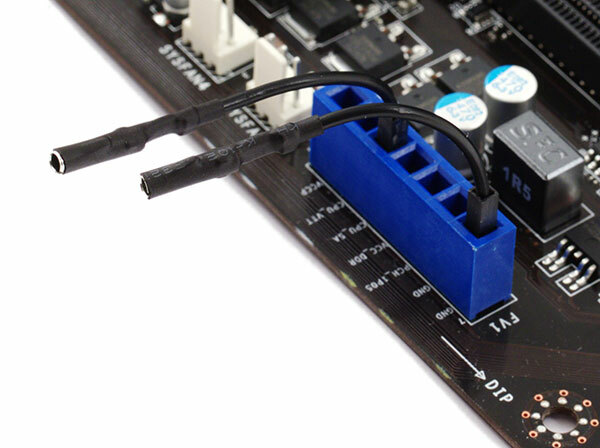 No part obstructs another part, auxillary fan connectors are situated at the edge nearest to user, the cooler is compact. The set of expansion slots is optimal: 2 x PCIe x16, 2 PCI (should be enough for anyone; one may be obsructed, but only if a second dual-slot graphics card is installed). There's no IDE interface (and, obviously, FDD). V-Check Points are also located at the nearest edge. We also liked 'burnished-steel' procesor latches — a trifle, but a pleasant-looking one. CPU VRM is a traditional strong point of MSI. It features DrMOS chips instead of more usual MOSFETs (Gigabyte has adopted these, too), tantalum Hi-c Cap capacitors as well as plainer Japanese capacitors in all circuitry, improved ferrite chokes. We have already described all these technologies, since MSI has been using them for a long time, and not just in a couple of showpieces. In brief, such a CPU VRM allows higher clock rates (and quicker reaction to processor states changes), offers improved power efficiency, compact size (occupies less space on PCB and frees space around the socket for enthusiast coolers). We liked the onboard cooler as much. 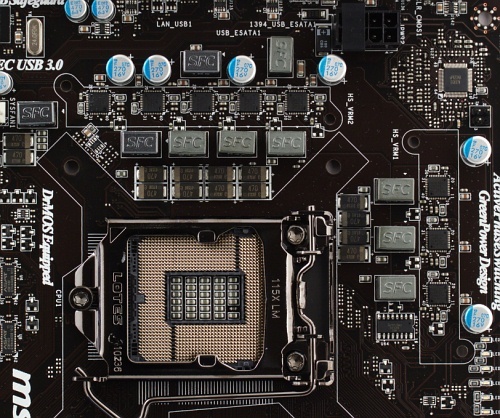 The DrMOS chips need less care, but still there are two large heatsinks interconnected with a heatpipe (which isn't needed, but, hey, the motherboard's the series flagship). The chipset that emits less than 6W is covered by a plain compact heatsink that obstructs nothing. All heatsinks, including chipset one, are fixed by metal screws. Although they could've glued the latter with hot adhesive, given it's dimensions. In other words, the motherboard doesn't require anything fancy, and MSI has provided a suitable cooler with only a small reserve of efficiency. 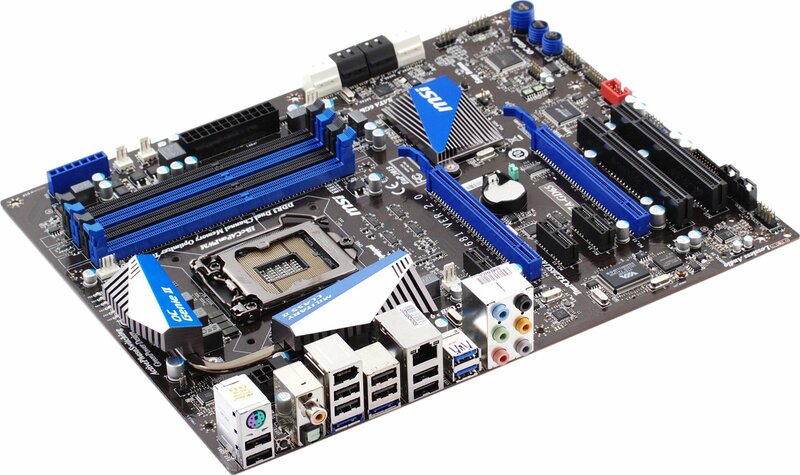 This might be an example for some other motherboard makers who install too many unnecessary heatpipes and whatnot. MSI P67A-GD65 doesn't support any 'concealed' proprietary technologies that should be described, but there are two interesting areas on the PCB. Firstly, the V-Check Points which, by means of bundled connectors, allow users to monitor system voltages in real time — CPU core, memory modules, chipset, etc. Frankly speaking, we have never found much sense in doing that, but if you like it, here you are. Nearby are PWM controller LEDs which indicate the number of active CPU VRM phases that may be reduced dynamically in standby or under light load (Active Phase Switching). APS saves a bit of energy by optimizing PWM controller operation. By the way, illumination can be disabled in BIOS or proprietary utility. Another corner hosts power, reset and OC Genie buttons. We sort of looked down on the latter in previous reviews, because it obviously couldn't provide results a serious overclocker could achieve. But this time Intel met regular users halfway, having utmostly simplified and unified overclocking of Sandy Bridge processors. So, suddenly, OC Genie is nearly the best tool to do it. One push of that button will let the system quickly set the maximum working multiplier of an unlocked K-series CPU. So if you're not into messing with increased voltages and such, just get a Core i5-2500K or a Core i7-2600K CPU, install it and push the button. Releasing the button will switch the system to a regular, non-overclocked mode. You have to agree that it makes nearly maximal overclocking available to any user, and it also makes OC Genie a real step towards avoiding BIOS at all. Even if it looks nice. By the way, does it?